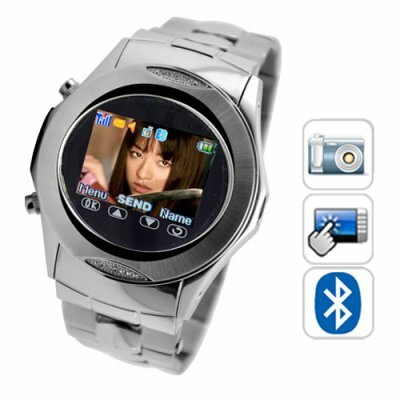 Successfully Added Assassin - Quad Band Touchscreen Mobile Phone Watch + MP4 to your Shopping Cart. Introducing one of the most stylish and powerful watch phones on the market, the Assassin. If you thought touchscreen was only for mobile phones then think again. This watch phone has a colorful 1.3 color touch screen that is surprisingly simple to navigate and can be easily accessed even without the use of the built in stylus. The touchscreen is pressure sensitive and responds to your command quickly and without fault. This is truly a high quality screen that performs just as well as a cellphone touchscreen. The Assassin functions as a portable mp4 player as well. With the built in media player you are able to effortlessly play your favorite music, movies or pictures, all with the simple tap of the touch screen! Just plug this watch phone into your computer via USB cable and load your favorite media files onto the mini SD card. The audio can then be played through the included Bluetooth earpiece set, wired earphones, or directly through the built in speaker. The choice is yours. This heavy duty watch phone is constructed using only top grade materials such as stainless steel casing and wrist band as well as high quality electronics and crystal clear touchscreen. The feel of this watch is the same you would expect from watches costing more than 5x the amount. Solid build quality, beautiful looks and fully functional electronics make for an unbeatable combination of quality, style and convenience that is sure to set the standard for high quality watch phones. Since The Assassin supports all four GSM frequencies so you can use this watch phone anywhere in the world and remain confident that it will always work. Additional features include a calendar, to do list, text document (.txt) reader, alarm clock, WAP internet and sound recorder. This watch phone has it all! Order one today or buy some in bulk for the perfect eBay resell item! The Assassin is in stock and ready for immediate shipment. Brought to you by the leaders in high quality wholesale electronics, Chinavasion! This watchphone looks similar to the Gauntlet and Special Ops, do they use the same hardware? Yes. The Assassin uses most of the same excellent components found in our successful Gauntlet and Special Ops watchphones, and merges them together to bring you one of our most attractive watchphones ever. This phone looks elegant, smart, and will not be out of place at formal functions. As it has a stainless steel body and strap, it loses a point for the added weight, but I would be happy to wear it wherever I go. Delivery was fast, and efficient. Thank you Chinavasion. on 2010-12-11 02:40:22 Top Quality Product. on 2010-12-05 11:26:18 Great quality electronics and workmanship. Delivery in 2 days, amazing!! The watch has many more functions than expected, only the battery time is short, but for the rest my general apreciation is Good. The sound is poor quality and produces echo to the listener, this issue need to improve the quality, and the power of the output sound using bluetooh is very smooth in loudy enviroments . But my general conclusion is Thanks again Chinavasion!. Again excellent delivery time. This product is just awesome, and I use it all the time. The quality is great and is a very nice looking watch. It only cost me $10 to knock a few links out and sits comfortably on my wrist. People are amazed when i tell them its a phone. Even more amazed when I tell them the price.